You will quickly find, that there are many different opinions on the topic. Is there a best way to set up your grow tent? There definitely is a best way to set up your grow tent. Instead of trying to correct mistakes during your grow, it will save you tons of time and effort, to do this right from the start. Electrical wires and equipment in general. Get these 4 right, and you'll have done 90% of the preparatory work that's needed to successfully finish your (first) grow. You want your lights as close as possible to your plants, without bleaching them or burning them and while still covering your full canopy. Because: the closer your lights, the more compact your nodes, the larger, denser and more potent your buds will be. But there is such a thing as ‘too close’ and ‘too much light’. Both can be devastating to your yield if kept unchecked. Your lights should cover the full area of where your plants are located. Plus, your lights should penetrate the full canopy. This means also the lower parts of your plants. Anything less and your yields will suffer. The light does not cover the full canopy, and does not penetrate into the lower parts of the canopy. This happens when your light is too weak for your specific coverage area and/or your light is hanging too high. The light is powerful enough to cover the full coverage area and penetrate into the bottom part of the canopy. Also, the more watts your lights, the more heat and intensity they’ll generate and the more distance they’ll need from your canopy. A 1000W HID light will need double the distance from your plants compared to a 300W HID light. So, what is the optimal distance for a LED light…? 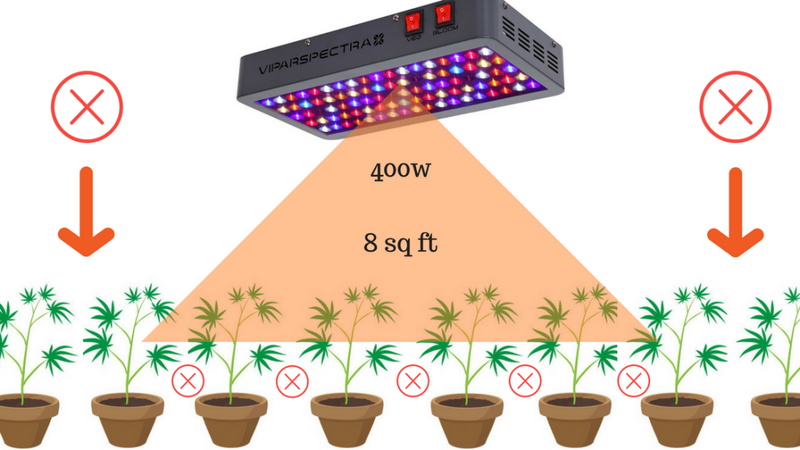 LED grow lights generate less heat than HID lights, but generally, generate more intense light than HID lights (comparing same wattage lights). Plus, they need some room (height) for all the different colors / wavelengths to blend. Both these characteristics make LEDs need more distance from your plants than HID lights. As said before the optimal distance with LEDs also depends on your brand and the specific model of that brand. Different LED manufacturers use different diodes with different strengths (1W, 3W, 5W, 10W). Not only that, but they use a different quality diodes and/or (secondary) reflective lenses. 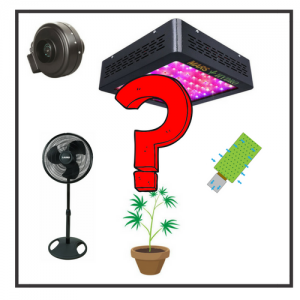 All of these factors influence the optimal distance between your plants and LED light. Flowering: 12” – 18” inches above the plants – Growth and Bloom switches together. Flowering: 18” – VEG and BLOOM switches together. 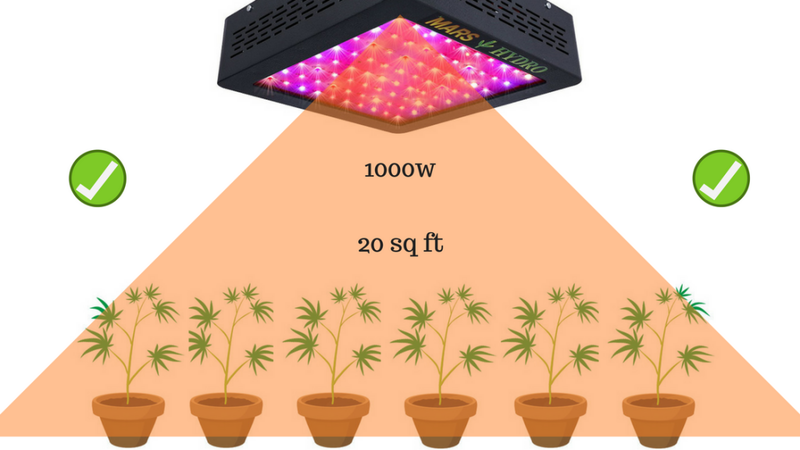 A very effective strategy for maximizing yield with LED is a flat canopy (make your plants short and wide) so that the light has an easy time penetrating the bottom of the canopy. You want short and wide plants. SCROG is a great training method which helps you achieve this. Important note: Keep an eye on the tops of your plants…if the tops start to turn white (bleaching), it’s time to raise the lights at least 1-2 inches and possibly more until the bleaching stops (light burn). 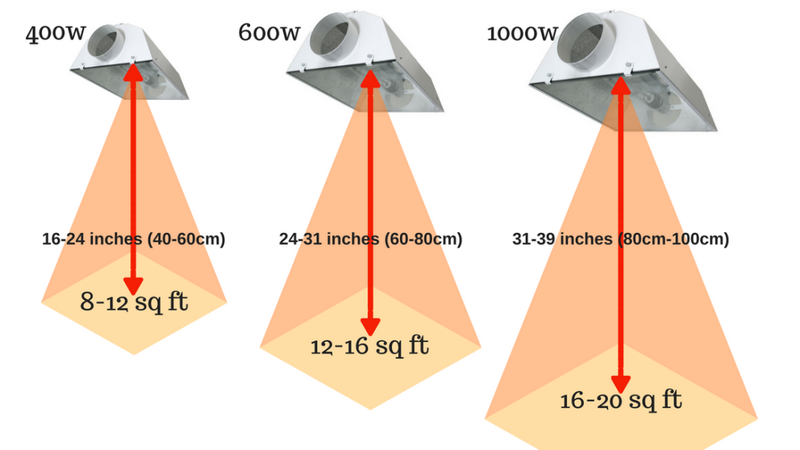 What's The Optimal Distance for a HID (HPS or MH) Light…? With HID (HPS or MH) lights there is no difference between brands. The strength and effectiveness of your heat venting. Too hot for your hand, means too hot for your plant. If it’s too hot for your hand, move your HID light up in 1-2 inch increments, until it stops burning your hand. These numbers are based on HID lights with regular reflectors (non-air-cooled). If you do have air-cooled reflectors, you can put your lights quite a bit closer and that’s where the ‘back-of-the-hand-test’ comes in (check the heat with the back of your hand, and when it's too hot for your hand it's too hot for your plants). Important note: when getting a HID light place your ballast outside of your grow tent. This not only helps with venting the heat, but also with electrical safety (humidity and accidental splashes of nutrient solution or water are a real risk). Setting up your ventilation properly is extremely important. To grow properly, your plants need a constant supply of fresh air with CO2. But it’s also your main tool for temperature control. This is especially important if you’re growing with HID lights which radiate a lot of heat, or live in a tropical climate. First of all, it’s important that you position your exhaust fan on the opposite side of your passive intake holes or inline intake fan. There should be a lot of space between them. 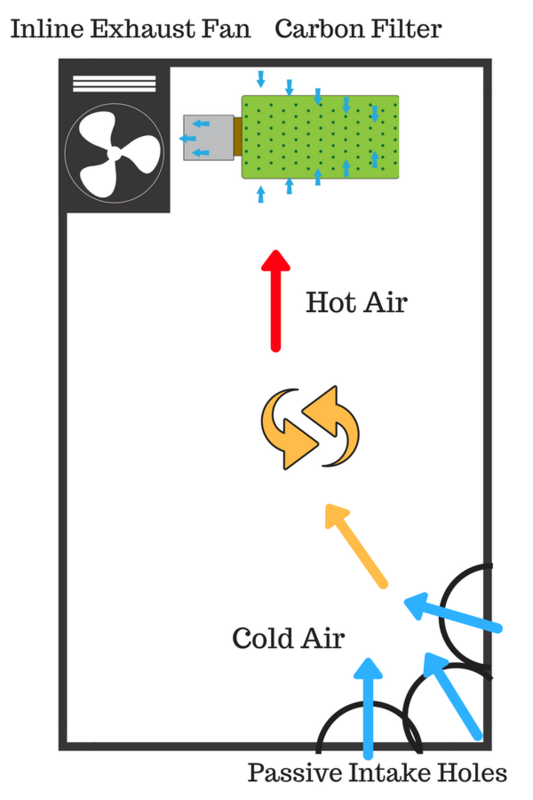 This way you’ll maximize the airflow in your grow space / grow tent, which helps greatly with venting heat and providing a constant stream of fresh air. 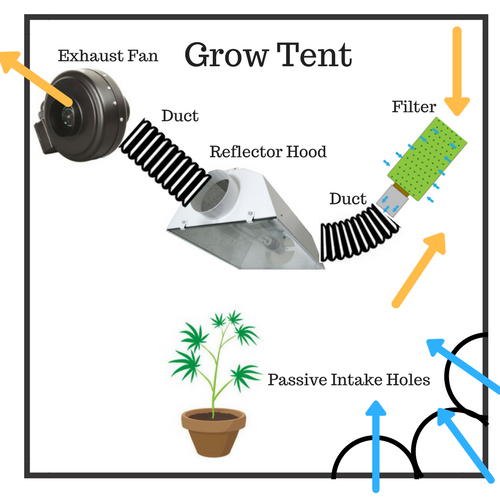 Place any exhaust fans in the top part of your grow tent / grow space. Hot air rises higher, and you want to filter out the hot air more than anything. Note: Still looking for an exhaust fan? Check our quick and easy guide on how to choose a specific model for your specific setup and a classic example of a quality exhaust fan. If you’re going for passive intake holes, it’s important that they are at least 3 times the size of the surface area of your exhaust fan’s surface area. Usually a tent does have passive intake holes. If not, it’s best to make 3 same size holes on the opposite side of where your exhaust fan is. You could also make 1 big hole, which is 3 times the size…but this will be less effective in maximizing airflow. Regular circulation fans that are placed to the sides and some inches higher than your plants. This will greatly enhance the movement of air between your lights and the canopy, which in turn will help greatly with venting the heat. Just make sure not to point them directly towards your plants with full force and they don’t blow too hard as this can result in ‘wind burn’ (wind burn is the term for leaves drying up because of a rapid loss of water, caused by strong winds). There are 2 ways you can set up your carbon filter based on whether you’re using air-cooled HID lights or not. In this case, the best way is to connect the carbon filter to the intake of your exhaust fan, inside your grow space / grow tent. This way you will be sucking the air straight through the filter, then outside of your tent. This simply is the most foolproof way to prevent unwanted smells. You can only do this if you have enough room in your grow tent. 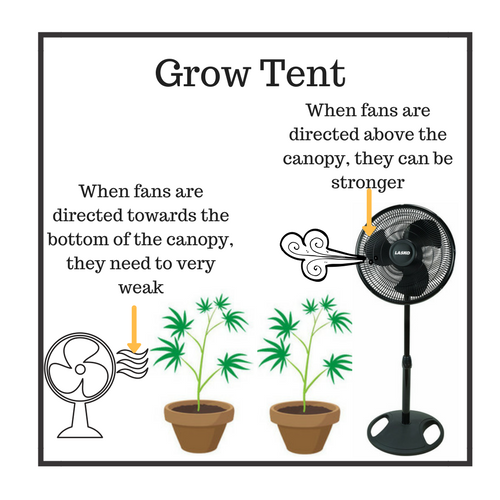 And this I exactly one of the reasons why it’s always a good idea to get a bigger grow tent than purely the size that’s needed for your plants. The other reason is that you want enough room in your grow space / grow tent to conveniently inspect your plants and make adjustments to the height of your lights for example. Place your exhaust fan outside your tent, but keep the carbon filter inside. This will be a quite a bit noisier and less stealthy though. 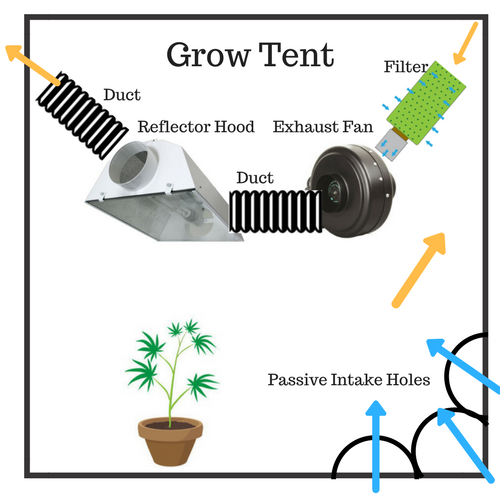 The least preferred method is to place both the carbon filter and exhaust fan outside your grow space / grow tent. But if you do this, take extra caution to seal everything properly (duct tape can come in handy here). Both work fine and in both cases, you keep the carbon filter inside…which is the best way to filter out marijuana odor. There’s a safety risk involved. KEEP THEM OFF THE FLOOR! This way you run much less risk to get electrocuted in case you do spill some nutrient solution or water. Now, what I like to do with any sets of bundled up wires, is to attach them to a piece of wood and attach this piece of wood to the poles in the tent. This way you’ll keep them off the floor, have an extra buffer (wood) and keep your cables organized! Bundle them together using zip ties / cable ties – (Amazon). Keep them outside your grow tent! It’s best you place your plants and the pots / buckets they’re in, in the center of your growing space / grow tent. This way you’ll give your lights a much easier time to penetrate the whole canopy. If some of your plants hug the boarders of your grow space, it will be difficult for your lights to reach those specific areas.